A loft addition is a very cost effective type of room addition due to the fact that your roof and foundation are already there. We build the loft within the existing high ceiling space. Loft additions are great for bedrooms, home offices, bonus rooms, bathrooms, game rooms and more. The main construction for a loft addition is the new structural floor system that is tied into your home's existing structure. Once the floor system has been installed the railings and non-structural walls can be configured to make any type of room you like. Loft additions are commonly designed to create; bedrooms, bathrooms, a baby nursery, bonus rooms, tv and media rooms, home offices, home theaters, a home library, laundry room for the second floor and more. These photographs show two completely different designs for the same model. 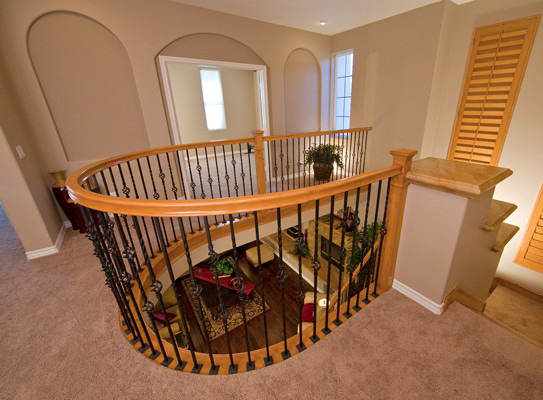 The first photo shows a radius railing extending the existing hallway and the new exercise room in the background. This was a flush floor installation (no step up). The second photo shows the same model only with a bedroom and a step up which provided even more ceiling height for the living room below. Architectural features like the arched doorways and the arched wall niche were added to blend the loft room addition into the original home. 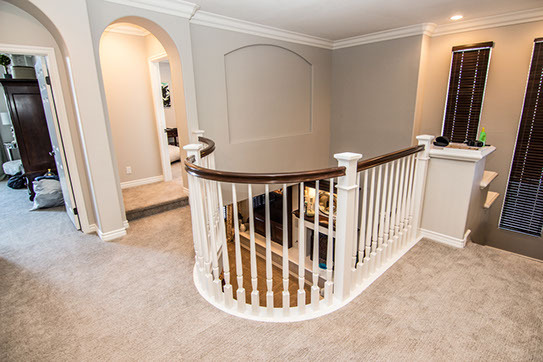 The stair railing was custom modified in both cases to match the railing below on the stairway.